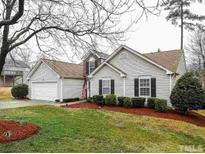 Below you can view all the homes for sale in the Woodchase subdivision located in Fuquay Varina North Carolina. Listings in Woodchase are updated daily from data we receive from the Raleigh multiple listing service. To learn more about any of these homes or to receive custom notifications when a new property is listed for sale in Woodchase, give us a call at 919-213-9465. *Newer Roof with warranty * Stainless Steel Appliances *Pond at rear of lot *Open Floorplan with Sunroom *Spacious Patios are ideal for expanding your outdoor lifestyle *Expanded Kitchen Cabinets and Counters than other homes of this plan *Dual sinks and Walk in Closet in MBedroom *Conveniantly located on north side of Fuquay with great access to shopping MLS#2237165. 2611.